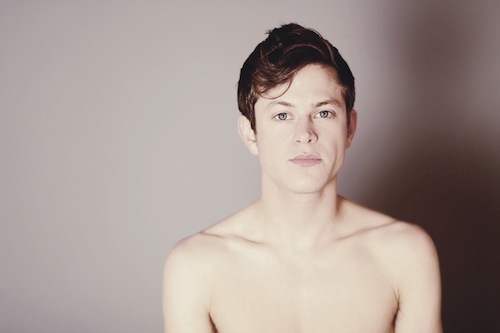 Mike Hadreas of Perfume Genius. Photo by Angel Ceballos and Courtesy Matador Records. Spring is usually the time we slowly transition the artists on our go-to playlists: adios Bon Iver, good afternoon Big Boi. But as the weather was soaring to record highs not long ago, our favorite new album was bringing us down to depths we hadn’t experienced since seeing Elliott Smith perform at the Empty Bottle in 2000. The album we’re referring to is “Put Your Back N 2 It” (Matador Records) by Perfume Genius, who played last night at Schubas. Now, we usually try to write about artists before they appear in concert in Chicago. We purchased our tickets for this show over a month ago, but due to certain circumstances, we never got around to writing a concert preview. Many apologies on our behalf. Still, after seeing Perfume Genius last night — the concert that was beautiful, crushing and memorable — we feel compelled to tell you about this musical act. On stage last night, Hadreas’ voice perfectly relayed the pain in his lyrics. His stage presence was fairly reserved; there was certainly a shyness in his demeanor, but he showed little reluctance in pouring out his heart through song. Between songs, Hadreas seemed genuinely flattered by the applause he received, and occasionally flashed a joyous smile. Seeing a bit of happiness in someone who sings about so much struggle was definitely a good thing. Still, while we don’t wish future problems for Hadreas, we are rooting for him to make more superbly heartbreaking music. See the video for “Hood” by Perfume Genius below. And to see a great photo from last night’s concert, check out this Flickr page.